Air Krete® cementitious foam insulation has been around for decades, but despite its many advantages it has not become a household name. That may change now that Dr. Energy Saver, a nation-wide network of energy conservation contractors, has acquired exclusive rights to the product. Air Krete, for those unfamiliar with it, has the look and feel of shaving cream as it’s injected into walls, ceiling or roof cavities. When dry, it cures into stable, lightweight solid foam. At R 3.9 per inch, it’s more effective than fiber insulations, like fiberglass and cellulose. It is even as effective as several of more expensive spray foam and rigid board insulations. Like other types foam insulation, it seals as it insulates, slowing up energy loss in two ways: resisting the movement of heat by conduction and stopping air leaks. Unlike messy polyurethane-based foams, Air Krete doesn’t rely on a solvent-based chemical process. It’s made up of air, water, and magnesium oxide (MGO) and is completely non-toxic. No hazardous fumes are produced during or after application, so homeowners do not need to vacate their homes for hours or days while it cures, as they do with polyurethane-based foams. Cleanup is with water. In fact, spillage washes off siding with water and is harmless to garden plantings, lawn, or pets. Nor is there any off-gassing of VOCs, such as formaldehyde, during the life of the product. Air Krete is especially well suited to retrofit applications. Many 2-part foams can’t be sprayed into a finished wood-frame wall because pressure generated by expansion will cause the wallboard to bow or even pop off the framing. Air Krete is non-expanding. It’s designed to flow and fill around electrical wires, outlet boxes and, if there are any, old underperforming insulation batts. Unlike standard 2-part spray foam insulation, Air Krete won’t heat up upon application, so there is no potential for excess heat generation. Polyurethane sprays foams, on the other hand, have been known to char, smolder or ignite when installed improperly. Air Krete won’t burn even during a house fire. Being water based, Air Krete does take longer to cure than other foams. Ventilation guidelines, including leaving the access holes unplugged, ensure reasonable dry times. 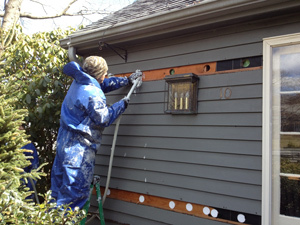 It is also essential to avoiding spraying Air Krete between vapor barriers. In some cases dehumidification may be recommended to speed the curing process. Shrinkage is a question that comes up when any insulation is installed in a wall, ceiling, or floor cavity. After all, if insulation shrinks (or settles) after installation, its ability to resist heat flow and to stop air leaks is compromised. Because it’s inside a closed cavity, shrinkage is difficult to detect. Unlike several other types of foam insulation, tests show that Air Krete will not shrink as long as it is injected into an enclosed cavity. Injection into an enclosed cavity allows the foam to be slightly “pressurized.” In an open cavity, pressurization is not possible, and slight shrinkage may result. Resistant to mold growth, even at high relative humidity. Seals effectively around the edges, preventing air infiltration. Does not expand or settle and completely fills cavities, including around obstructions and crevices. Does not inflict damage to environment or humans. Material is non-toxic, does not create any ozone-depleting CFC’s and does not contain any formaldehyde or carcinogenic fibers. In fact, it actually absorbs carbon pollution from the atmosphere! Does not burn or release any smoke. In fact, it may be used as fire-stop material. Has a de-oiling effect that deters rodents and insects. Is fully recyclable and can be used to enrich soil. May be used in wall, roof and ceiling cavities, in new or old construction. Serves as a soundproofing material and may be used inside interior sound partitions. When plumbing pipes are encased, water noises are significantly reduced. Because Air Krete is made of Magnesium Oxide (MGO), a refractory cement, it is ideal for high temperature applications. This sounds like a very useful versatile product, we do not have such types of spray insulation in australia as most spray forms are generally of a poly foam nature. Spray based crete insulation would certainly lend itself to some commercial projects, what is the type of machinery required to install this type of insulation? Air Krete? Interesting, Interesting, I Wont to installed and do it my self . How? Sorry, but Air Krete is not a DIY product. Correct application of Air Krete requires both training and expensive equipment. Contact the Dr. Energy Saver dealer nearest to your home for a free estimate. One Question I have about Aircrete is when it is applied in an existing wall – In the future if I need access to Plumbing and/or Electrical Wiring that has been encased in Aircrete Insulation – How hard is it to gain access? Good question. Although the “crete” suffix might lead you to make comparisons to concrete, Aircrete is a very light, yielding material that shouldn’t impede access to plumbing or electrical lines. It’s easy to dig your way through the material if you have to. What you’ll create is a pile of grey-colored powder. If this product has been around for decades, does that also mean it is no longer under patent protection? I.e. anybody could if they knew how, produce a similar if not identical product of low density aerated cement that is sprayed in situ without fear of being sued in the intellectual property courts? Developing your own version of cementitious foam is certainly an intriguing idea. But it would take time, money and quite a bit of trial and error. I think it would be smarter to simply call in a contractor who installs this product all the time. There are plenty of other DIY opportunities to improve home energy efficiency. Does this have sound deadening qualities? Yes, filling building cavities with AirKrete will improve the sound-deadening characteristics of the building assembly. But there are more effective ways to block noise transmission, like using steel standoffs and special drywall. The U.S. Gypsum Association (http://www.gypsum.org/) has good information on this topic. Is it strong enough for use in foundations? HORRIBLE PRODUCT…do NOT use. VERY corrosive. Ruined our metal building. Nancy, could you provide more details about your experience?